Kiss is letting bygones be bygones with the Rock and Roll Hall of Fame. After years of some charged rhetoric from the band members over Kiss' exclusion, Paul Stanley tells Billboard that news the group will be inducted as part of the class of 2014 is "terrific" and indicates "a changing of the guard and a different point of view" in the institution. "The same criteria that kept us out has now gotten us in, and that's terrific," Stanley says. "It's great to know that we didn't change or apologize for who we are, and we're being inducted for what made us what we are. For whatever got us bent out of shape before, it's clearly not the case now. Certainly from the fact that fans get to vote to the fact that some of the past inductees are vehement and rabid Kiss fans, things have worked out just fine. My issues over the years didn't change; what changed was the Rock and Roll Hall of Fame. So it's a victory for everybody. It's very, very gratifying, and I don't take it lightly. There are a lot of people today who are very happy that Kiss will be inducted, and I'm certainly one of them." 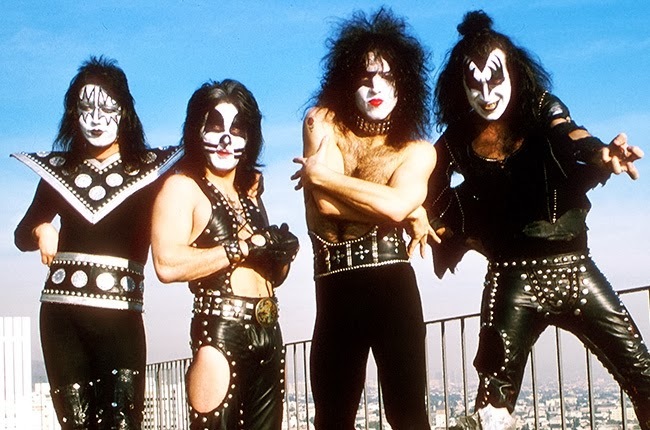 Stanley says it's "way too early" to know how Kiss will handle the induction ceremony on April 10 at the Barclays Center in Brooklyn, but he promises that "it will be unapologetically and proudly Kiss." Co-founder Gene Simmons recently commented that he would not be willing to perform that night with founding members Ace Frehley and Peter Criss, which Stanley says "I'm sure was heartfelt and off the cuff, and I can't take it beyond that. We'll see where we go from here. Peter and Ace are undeniably at the beginning of the band, and we built a foundation which has stood the test of time and has allowed us to build a monument for 40 years, so today I wholeheartedly embrace and acknowledge Peter and Ace and, likewise, a lot of people who have been in the band and also standing by the band -- and that includes the fans. But the idea of misleading or giving anybody a sense that we would ever go back to that (original lineup) situation is totally off the table. We've done that and, with all respect, it crashed for very similar reasons both times and things have moved on. I say without any animosity and with all respect that we wouldn't be here without what Peter and Ace contributed, and we wouldn't be here with them today." As for the rest of the class of 2014, Stanley noted that, "I'm more than well aware and have the utmost respect for all of the inductees. It's a diverse group, but nobody who I really scratch my head about and say, 'How did that person get in?' There's no disco people or rap people, and with nothing negative to say about any of them, that's not my idea of rock or rock 'n' roll." The new year will also bring a celebration of the 40th anniversary of Kiss' first two albums, and Stanley says the group will be up to "more of the same" -- which includes touring as well as the publication of his autobiography (listed as "Face The Music: A Life Exposed" with an April 22 publication date, according to Amazon.com) and the launch of the L.A. Kiss Arena Football League team. A Las Vegas residency is also being considered, according to Stanley. However, he adds, "It hasn't changed for 40 years. This is what we do. This is in my blood. This is what I breathe. So the idea of a special celebration for 40 years, I celebrate every day as an anniversary of getting this far."